Jessica's new partnership is tested; Harvey must prove a high-profile client's innocence; Mike tries to manage the fallout from his revelation. Louis offers Mike a future-changing case; Harvey and Jessica work together to bring down an old nemesis. Cameron has Harvey's client arrested for murder; Katrina tries to win over Louis; a British version of Harvey arrives at the firm. Cameron continues to use dodgy tactics on Ava's case; Rachel visits law schools; Mike reflects on the past. 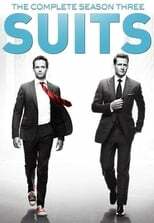 Harvey and Stephen clash over Ava's case; Harvey and Jessica strategize; Louis gets Rachel's help with a broken contract. An old nemesis returns; Harvey and Scottie are on opposing sides again; Louis ends up in Sheila's crosshairs; Mike and Rachel are under Jessica's scrutiny. Trust issues are brought to the forefront; Harvey and Scottie battle again; Louis wants to handle the dissolution talks; Mike wants to move forward in his relationship with Rachel. A major client demands that Harvey and Mike perform an unpleasant task; Louis faces a difficult challenge; Laura collects an old debt.